Former hotel-barge operators Eleanor Garvin and Dennis Sherman abandoned ship three years ago to restore a tired pile in Burgundy’s verdant vignobles. The proud hoteliers invite FrenchEntrée behind the scenes at the luxury Domaine de Cromey. 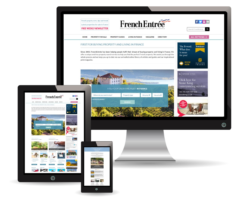 FRENCHENTRÉE MAGAZINE: What brought you to France? Eleanor Garvin: We left the US in 1983 with the naïve idea of apprenticing to the great chefs of Europe and simply never went home. What began as a summer adventure when I was 23 turned into a new life in a new world. Dennis and I set out from Annapolis, Maryland, with a couple of one-way tickets to Europe and the money from the sale of my car. I met Dennis while working in the kitchen of a restaurant called Les Survivants. He always says we consommé-d our relationship. Claire Owens, the owner-chef, had lived and cooked in Paris and said if we were serious about food and wine, we had to go to France. So we did. We owned and operated the luxury hotel-barge Le Papillon for a decade in the 1990s in Burgundy. Its popularity led us to expand the Papillon repertoire to land-based holidays, and from 1993 to 2014 we took Papillon Select Tours to villas in regions where food and wine were a priority. Burgundy was a logical spot to settle. Add wine and the classic cuisine, and it all made sense. Burgundy is home, it’s in our blood. FE: Is this your first French property? If not where did you live before? 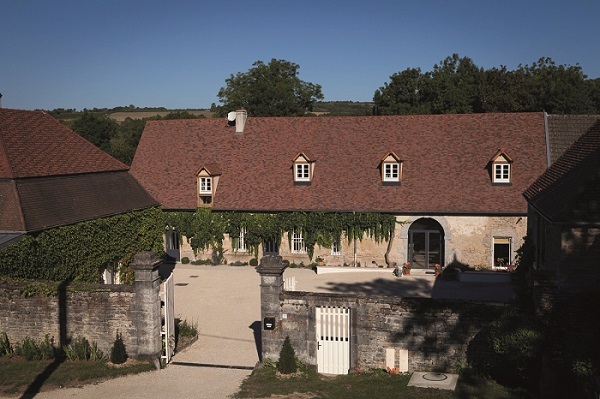 EG: With the help of David and Brenda Miley, our partners at wine company Elden Selections, we purchased this gem of a property in the heart of the Burgundy wine region in 2014 and opened for business in August 2016. The Domaine de Cromey sits among the vines in a peaceful vale to the south of Beaune. Dating from the early 1700s, the locals call it the ‘château’ (and in the past there were, indeed, Lords of Cromey). But the property was always more of a baronial farm than a residence. FE: What was your plan for the Domaine? 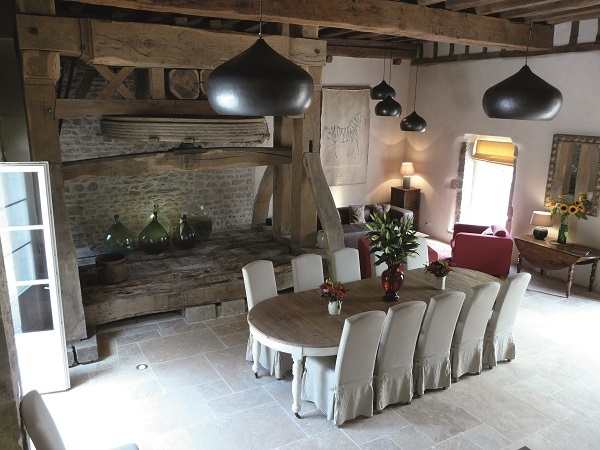 EG: We decided to transform it into a luxury farmhouse complex dedicated to the enjoyment of the food, wine and natural beauty of the Burgundy region. 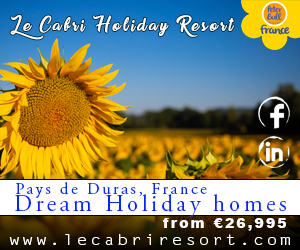 The Domaine de Cromey comprises six en-suite rooms in three separate buildings, which are set around a courtyard and nestle within several acres of a walled park. It offers modern comfort and quiet sophistication in a setting from another era. in a true Burgundian cellar and in a dining room dominated by a massive 18th-century wine press. FE: What was your main challenge? EG: It was a team effort between the project manager, us, the Mileys and, funnily enough, Jenny Higgs, who was our partner on the original Papillon barge. 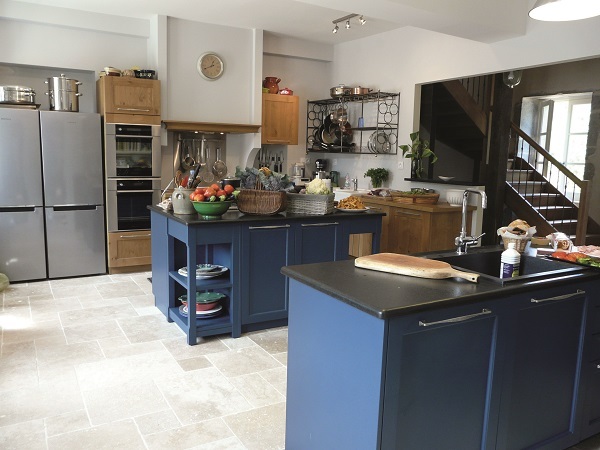 EG: We wanted a classic Burgundian country feel with lots of oak, flagstones, parquet, cut-stone windows and door linings, massive open beams – simply sand-blasted – and tomettes [hexagonal floor tiles]. We also wanted to create multiple terraces opening out on to various areas of the park, meadow and the vineyards. EG: We had completely renovated a small country house as a holiday rental previously. The Mileys have done many big projects and Jenny works as an interior designer. FE: Where did you source the furniture, paintings and other decorative objects? EG: A lot of it was our own personal stuff. But it took a year and a half of shopping, visiting the big trade shows in Paris and keeping a keen eye on the brocantes to furnish Cromey. Some of it came from our artist friends. EG: There is a lot of bureaucracy to deal with, so get professional advice. A good accountancy firm pays for itself. EG: We were fortunate to have a team of clever, imaginative and open-minded people looking at what was essentially a blank canvas. Everybody makes mistakes, but we avoided many problems simply because we were well organised and studied everything down to the details. We made some big, bold decisions that worked. I can’t think of anything major that we would change.